Perfect for a Bachelor Party! I’m starting this post with Semi-Primal Husband’s testimonial: “This is my new #1. You could give this to anyone and I bet they wouldn’t know that it’s Primal.” I have to agree – this is my new favourite dessert. 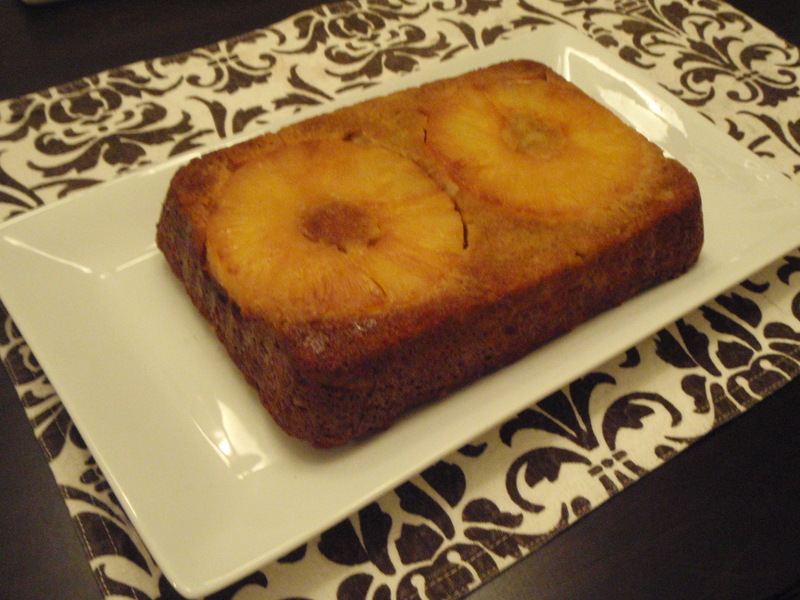 The juices from the pineapple make the cake really moist and sweet. It was hard for us not to eat the whole thing. 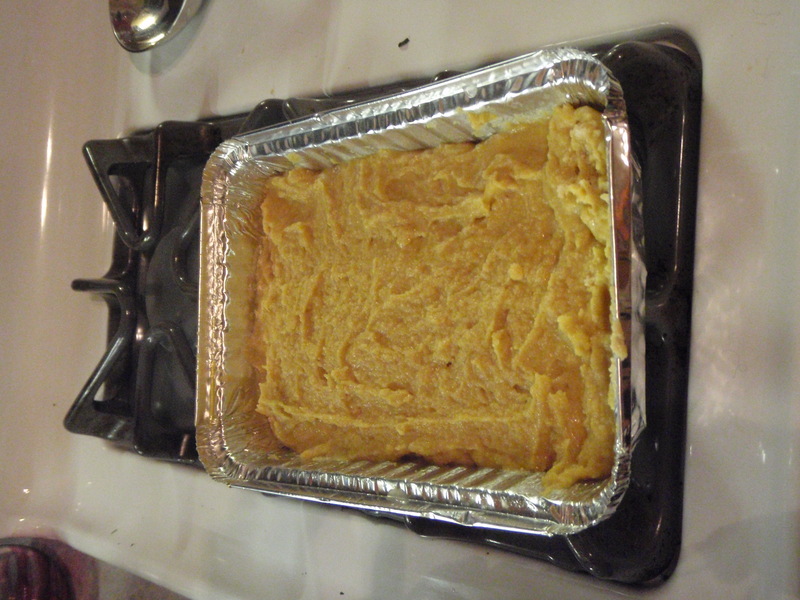 – I used a rectangular small baking dish (see pic at bottom), which fit the 2 slices of pineapple perfectly. Start with caramelizing pineapple slices – In a non-stick skillet, heat 1 tsp of coconut oil. 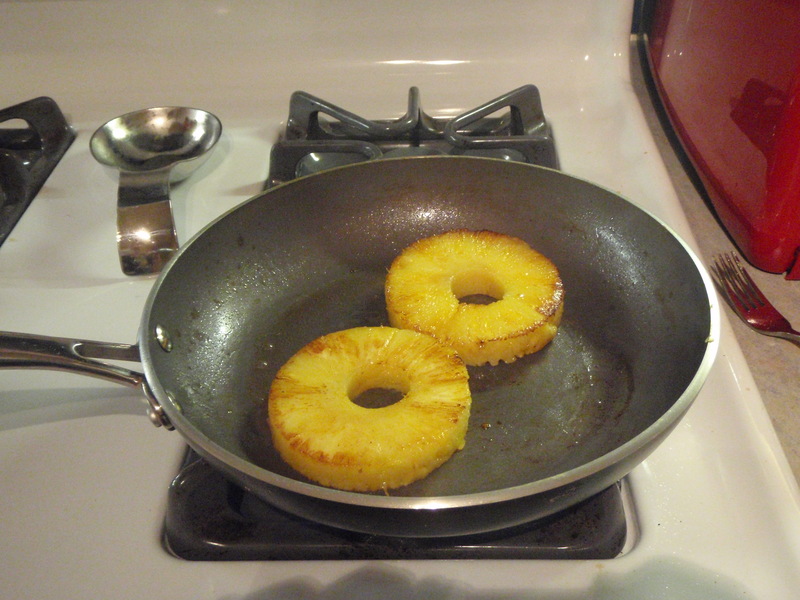 Add the pineapple and let it fry for about 2 minutes – until it’s golden brown. Pour the vanilla extract on top while frying. Flip pineapple and fry the other side. Remove and put pineapple at the bottom of your baking pan. Melt the coconut oil and honey and then slowly add it to the mix. Bake for about 45 minutes – check after 30 minutes because you might have a better oven. You want to be able to stick a fork into the middle and have it come out dry. Put a plate overtop of the baking pan and turn it upside down so that the baking pan is now upside down over the plate. Remove baking pan so that pineapple slices are the centerpiece of the cake. Try not to eat the whole thing. Should you grease the pan at all? OH YA!! Yes…thank you for pointing that out. I always forget to write that step. You can use non-stick spray (not paleo, but i can live with that) or if you want to be totally paleo, you can melt some coconut oil and grease it with that. Hope you and almost-baby are doing well Courtney!!! What is the size of that pan? @Kellie – It is SO GOOD! You don’t even need the added honey…i often make it without. I think it was about 6″ by 4″. I’ve also made it in 9″ by 9″ and a bunch of different sizes, so you could use pretty much anything. You may need to adjust the baking time based on how thick it is. wow! Looks fantastic! I just found your site through a link from Mark’s Daily Apple! I look forward to seeing more of your posts. P.S. I recommend always posting the dimensions of the pan you use for baking. It makes such a difference in baking time and consistency of results! Glad you like the site! 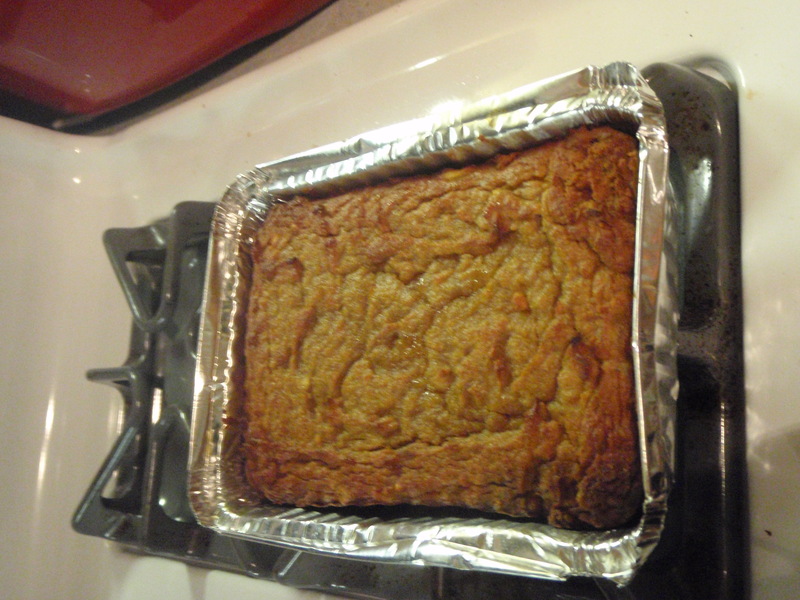 Thanks for the tip….I will include the baking dish size next time! I’m getting ready to kill this cake yummy! … So I really want to use this recipe for my birthday cake but my party will be at my mom’s house and she violently hates bananas. Any recommendations for a banana free version? Apple sauce? oooohhh, that’s a tough question. I really don’t know. The apple sauce would have a similar texture to the mashed banana’s, so I think it might work. I’m just not certain the taste would be as good with the coconut flour and pineapple. Perhaps some sort of tropical fruit that’s been mashed might also work? Like a mango? Whatever you choose, I would recommend trying it before you serve it as a birthday cake!